“Red Carpet, 20 Years of Fame and Fashion” and published by Publisher Lena Tabori from Welcome Books in New York. Lena is an extraordinary publisher and interested in many different subjects and of course – photography. Today I have received an invitation for a photography auction that I’d like to share with you. 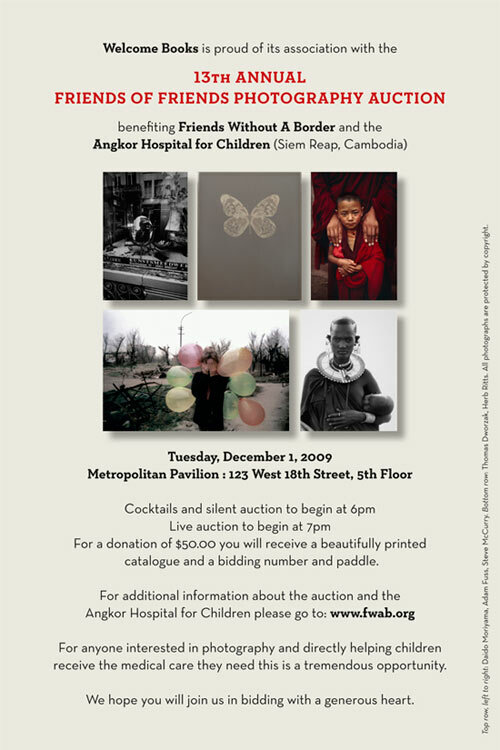 As some of you already know, Welcome, and most particularly our art director Gregory Wakabayashi has been involved for some years in the organization of a photography auction that raises money for a children’s hospital in Cambodia. Each year some of our photographers are involved (Amy Arbus, Eric Meola, Douglas Kirkland this year). Each year Greg creates an email announcement under our name. Attached is this year’s which I hope you will all share with everyone you know.